With two great lenses, two educational guides and an online educational class, this kit is sure to get your creative juices flowing. The included AF-S DX Micro NIKKOR 85mm f/3.5G ED VR and AF-S DX NIKKOR 35mm f/1.8G lenses will help you expand your imaging horizons, from exploring the smallest wonders of the macro world, to stunning portraits of your family and friends. Learn how to make the most of each lens through two included photography guides, one guide dedicated to macro photography and the other to portrait perfection. There’s even an invitation to a special online class from Craftsy.com so you can get up and running with your new lenses in no time! Reveal the unseen through your macro images. The AF-S DX Micro NIKKOR 85mm f/3.5G ED VR lets you to create amazing life size (1:1 reproduction ratio) photos that showcase even the smallest of details. Hone in on the dazzling minutiae of nature. Create photos that make the smallest of everyday objects look grand. This medium-telephoto NIKKOR lens allows you to shoot with ample working distance—even during handheld capture. Built-in Vibration Reduction (VR II) image stabilization helps to deliver sharp images for stunning macro shots you’ll want to share with everyone. Create those dreamy shallow focus portrait and close-up photos that feature beautiful bokeh or softly blurred backgrounds. Capture sharp and vibrant images at birthday parties, dinner parties and way past sunset courtesy of its very wide aperture. With the AF-S DX NIKKOR 35mm f/1.8G, your photos render to a classic “normal” angle of view (approximating what we see with our eyes). Compact and lightweight, this prime lens is small enough to keep in your camera bag so you can be ready to capture every memorable portrait and candid that comes along. Get started quickly and learn how to make the most of your two new lenses with the included two helpful guides, the Nikon Macro Photography Guide and the Nikon Portrait Photography Guide. Interested in creating tiny world macro imagery? Want to create the most dazzling portraits of family and friends? Each booklet presents exercises that will help you maximize your Macro & Portrait skills as well as useful hands-on tips for everyday shooting. 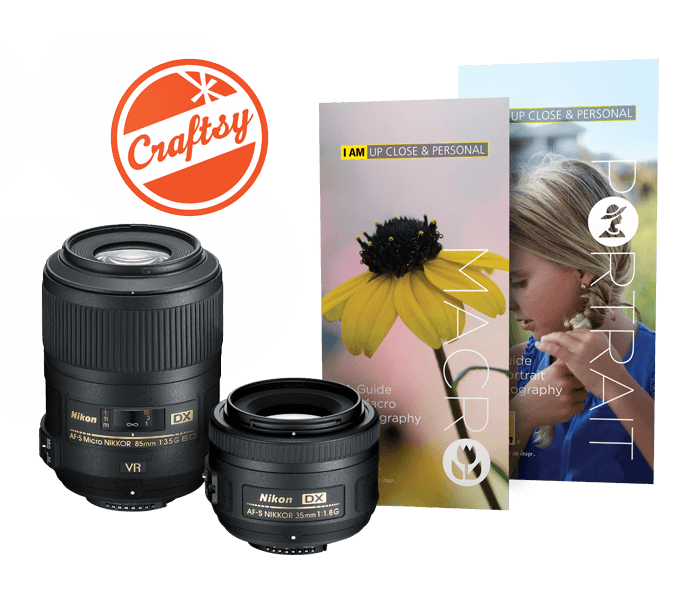 To ensure you get the most value possible from your new lenses, we've partnered with Craftsy, a leader in online education to create a special class for Nikon photographers. In "Get to Know Your Lenses: Portrait, Macro & More" professional photographer Layne Kennedy covers the basics of both Macro and Portrait photography. Craftsy's online platform makes it easy for you to follow along, take notes, and interact with Layne and fellow students as you learn how to use your camera and lenses.